Take a trip back in time and learn what life was like in our community when the first pioneers came to the Deerfield area to live in the late 1800s. Play games, make your own log cabin, and see pictures of kids who lived in Deerfield over 100 years ago! In this video we visit the Historic Village in Deerfield, which is on property right next to our school. We see the Casper Ott cabin, which is the oldest building in the county, the Little Red Schoolhouse, and take a trip to the local cemetery and learn about one of our community's earliest pioneers. 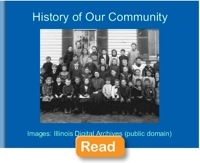 See historic images of Deerfield in this eBook, History of Our Community. As you read the book, discuss how our community has changed over time. Many things have changed? Is anything the same? Teachers, click on the image and the book will open in a new window. Watch “as is” or click on “view large” in the menu bar below the book viewer. Click on the arrow or page corner to view the next page. Watch these History Channel videos to learn how transportation has helped communities grow. Teachers, check out the lesson plans page for tips on making the video player size bigger. Have you ever been to Deerfields Bakery? Deerfields Bakery has been in our community since 1972, but the family has been in the baking business since 1886. That's just about the same amount of time that people have lived in this area. Watch the movie as your teacher reads the information on the screen. Build your own log cabin. Find nice sturdy logs (or maybe some brown construction paper), then cut off the back and trim them to size (or cut the brown paper into strips). Start at the bottom and work your way up. Don't forget the windows and doors! Can you jump rope? Visit the Dalles Web site to learn games that pioneer children played in our community. Have you played any of these games before? Where did you learn them? Have you seen other children play games like these? Which games are your favorite? You might be surprised to see how many of them you know! Note for Teacher: Click MEPG format and when movie is playing, right click to download as QuickTime movie. This will allow you to watch the movie in a larger viewer. Listen to this song to hear what it was like to go to school in a Little Red Schoolhouse (just like the one next to our school). Take a walking tour of the Historic Village that is just across the parking lot from Kipling School. As you visit each location, tell your teacher, buddy, or a classmate something you have learned about our community. Do you have a favorite book about Communities? Bring it along and read it again. Bring along jump ropes and other games that children played in the early days of our community as you visit the Historic Village and talk about all the things you learned in the Communities Unit.